the ties of relationship. Undoubtedly. Allah is watching you all time. mixing it with your property. Undoubtedly, it is a great sin. you, then consume it with taste and pleasure. them therewith and clothe them and speak to them good words. therefrom and speak to them good words. they should be afraid of Allah and speak the upright speech. enter into the flaming fire. been made and debts. Your fathers and your sons, you know not which of them will be more profitable to you. This is fixed proportion from Allah. Undoubtedly Allah is All Knowing, Wise. beneath which flow rivers will abide therein. And this is the great success. Fire, in which he will abide and for him is degrading torment. or Allah envisages some way for them. leave them alone. Undoubtedly Allah is most Relenting, Merciful. them, he says, 'now I repent' nor for those who die as infidels. For them We have prepared a painful torment. a thing and wherein Allah has placed much good. not anything thereof. Will you take it by slander and with manifest sin? from you a most firm covenant? 22. And do not marry those women whom your fathers have married, except what has already passed. Undoubtedly, that is an act of indecency and wrath and an evil way. except what has already passed. Undoubtedly. Allah is Forgiving, Merciful. there is no sin in what you mutually agree! Upon after fixation. Undoubtedly, Allah is Knowing, Wise. you to have patience. And Allah is Forgiving, Merciful. you with His Mercy. And Allah is Knowing, Wise. away from the right path. mutual consent. And kill not yourselves. Undoubtedly, Allah is Merciful to you. that is easy for Allah. enter a place of honour. whom you have sworn compact give to them their share, undoubtedly every thing is before Allah. then seek not any way of excess against them. Undoubtedly, Allah is Exalted, Great. unity between them. Undoubtedly, Allah is knowing, Aware. and the wayfarer and to your male and female servants. Undoubtedly, Allah loves not the proud, boastful. His bounty. And We have prepared for the infidels a degrading torment. and whose companion has become Satan, then what an evil companion is he? given them? And Allah knows them. you as a witness and a guardian against all those. after burying them in it, and they could not be able to conceal; anything from Allah. more upright. But Allah has cursed them for their infidelity, so they believe not, save a little. the decree of Allah is bound to be carried out. whomsoever He pleases, And whoso associates partners with Allah has forged a great sin. pleases, and they shall not be wronged a single date-thread. say about infidels, 'these are more guided on the way than Muslims. wisdom to the children of Abraham and granted them a great kingdom. where there shall be shade only shade. people, judge with justice. Undoubtedly how well Allah admonishes you, verily Allah Hears Sees. Allah and the Last Day. This is better, and its end is best. reject him wholly. And Satan desires to lead them far astray. that the hypocrites turn away from you averting their faces. come to you swearing by Allah that our object was kindness and concord only. messenger should intercede for them then surely, they would find Allah Most Relenting, Merciful. from the eve of their hearts. and stronger in establishing faith. Allah, viz. the prophets, and the truthful, and martyrs and the righteous, and what good companions are they. 71. 'O believers! Take precaution, then march forth towards enemies in bits or go forth all together. was Allah's favour on me that I was not present with them. If I would have gained a great gain. of Allah, then he is slain or be He victorious then soon We shall give him a great reward. defender from Yourself and give us any helper from Yourself. friends of Satan's undoubtedly, the Satan's strategy is weak. little and the Hereafter is better for the god fear, and you shall not be wronged a single thread (a least). them, then they say, 'this is from Allah and if some bad reaches them, then they say, 'This has come from you. Say you, 'All is from Allah. Then what happened to them, they seem not to understand anything. yourself. And O beloved! We have sent you, as a Messenger to all mankind and Allah is sufficient Witness. them and trust in Allah. And sufficient is Allah as a Disposer of affairs. Mercy upon you, then surely you would have followed the devil save a few of you. there is a share in it for him. And Allah has power over everything. the same. Undoubtedly, Allah is Reckoner of everything. Resurrection of which there is no doubt. And who is more truthful in his word than Allah. you shall never find a way for him. them as friends or helpers. keep aloof from you and nor offer you peace and withhold not their hands, seize them and kill them whereever you find. And these are against whom We have given you clear authority. this is his repentance near Allah. And Allah is knowing. Wise. is upon him and has cursed him and has prepared for him a great torment. not to him, 'you are not Muslim, you seek the goods of living world, then with Allah there are spoils abundant. You too were such before, and then Allah conferred His favour on you; so you are duty bound to investigate. Undoubtedly, Allah is aware of what you do. have emigrated in it? Then the abode of such people is Hell. And an evil returning place is that. overtakes him, then his reward lies on Allah And Allah is Forgiving. Merciful. you fear that the infidels will afflict you. Undoubtedly, the infidels are your open enemies. wish that in case you become negligent of your arms and your baggage, then once they may fall upon you. when you are secure, establish prayer as usual; undoubtedly, the prayer is a fixed time obligation on Muslims. amongst people as you are shown by Allah. And quarrel not from the side of deceivers. which is disliked by Allah. And Allah has encompassed their doings. on behalf of them with Allah on the Day of Judgement or who will be their pleader. and great is the grace of Allah upon you. whomsoever He pleases. And whoso associates with Him any partner has indeed strayed far away. that they would cut the ears of cattle and will certainly bid to them that they would alter the creation of Allah. And he, who takes Satan for a friend beside Allah, has suffered a manifest loss. rivers abiding therein for ever. Promise of Allah is true and whoso word is more truthful than Allah. evil shall be requited thereof and he shall not find, besides Allah any protector or helper. and they shall not be wronged a bit. faith of Ibraham who was separate from every falsehood? And Allah took Ibraham for His fast friend. maintain justice towards orphans. And whatever good you do, then Allah is aware of it. greediness. And if you do good and be god- fearing then Allah is aware of your doings. candling in the midst. And if you do good and be god fearing then undoubtedly, Allah is Forgiving, Merciful. 133. 'O people! If He pleases, He can take you away, and bring others. And Allah has full power to do this. 134. Whoso desires the reward of the world then with Allah is the reward both of the world and of the Hereafter. And Allah is Hearing, Seeing. distort or turn your face, then Allah is aware of your doings. Messengers and the Last Day, then certainly he strayed far way. then after increased in infidelity, Allah will never forgive them nor will show them the way. you would be like them too. Undoubtedly, Allah will gather hypocrites and infidels all in Hell. for the infidels against Muslims. show to the people and remember not Allah but little. find a way for him. purely; for Allah, then these are with the Muslims. And soon Allah will give a great reward to Muslims. 'some we believe and other some we deny,' and desire to envisage a way between believing and disbelieving. of them in believing to them, soon Allah will give their reward and Allah is Forgiving, Merciful. took from them a firm convenant. hearts because of their infidelity. So that they do not accept faith but little of them. conjecture, and undoubtedly, they slew him' not. witness against them on the Day of judgement. were lawful for them, and because of that, they kept away many from the way of Allah. unjustly, and those of them who became infidels, We have prepared a painful torment for them. of poor due (Zakat) and the believers in Allah and the Last Day, to such, We shall soon give a great reward. and Issa and Ayub and Yunus and Haroon and Suleman. And We gave to Daud the Book Zaboor (Psalms). not mentioned to you. And Allah infects spoke to Moosa. after the Messengers. And Allah is Dominant, Wise. knowledge and the angels are witnesses, And Allah is Sufficient as a witness. 170. 'O people! The Messenger has come to you with truth from your Lord, then believes in him for your own good. And if you commit infidelity, then undoubtedly, to Allah belongs whatever is in the heavens and in the earth. And Allah is knowing, Wise. 171. 'O people of the Book! Exceed not in your religion, and do not say of Allah any thing but truth. 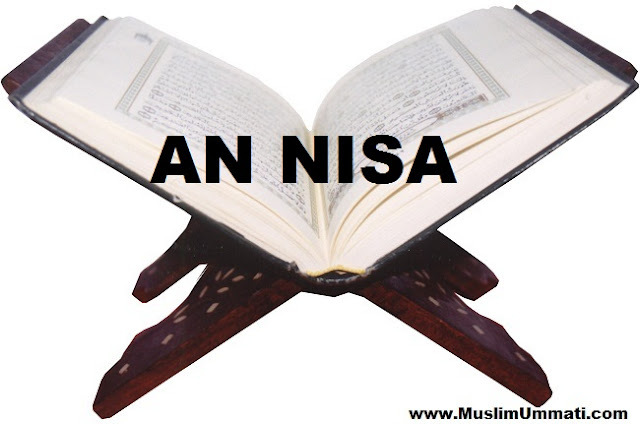 The Messiah Issa son of Marium is only the Messenger of Allah and His word that was sent to Mary and a spirit from Him. Then believe in Allah and His Messengers and do not say, 'three'. Refrain for your own good. Allah is the only one God. Far is it from His Holiness that He should have a son. To Him belongs whatever is in the heavens and whatever is in the earth. And Allah is Sufficient, as real Doer. 174. 'O people! Undoubtedly, a manifest argument has come to you from Allah and We have sent down to you a manifest light. 176. 'O beloved Prophet! They ask you for a decree. Say you, "Allah decrees to you in respect of a person who leaves neither father nor child that if a man dies and has no child and he has a sister then his sister has half in his heritage and the man will be the heir of his sister, if the sister has no child. Then if there are two sisters then they have two-third in the heritage and if there are brother, sister, males and females both, then the share of male is equal to the shares of two women. Allah explains for you clearly so that you may not go astray. And Allah knows every thing.